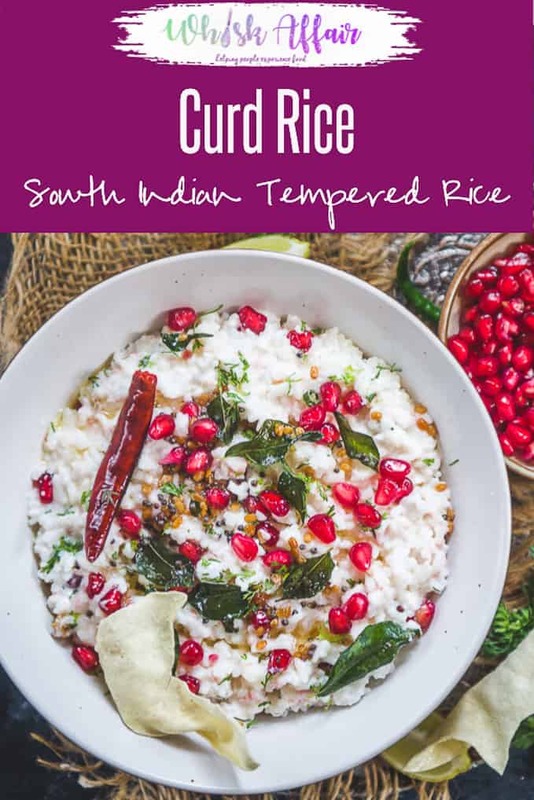 Curd Rice is a delicious easy south Indian rice recipe where cooked rice is mixed with curd and a tempering is done to it. Also known as Thayir Sadam, Yogurt Rice or Daddojanam, curd rice is a fabulous recipe to use leftover rice. It is a full meal in itself and can be had any time of the day. Serve it with pickle and papad as they are the best side dish for curd rice. Here is how to make curd rice recipe at home. When things becomes a routine, you start to take them for granted. Isn’t it? The same happened with curd rice. This dish is so regular in my house yet it never stuck me to blog about it. 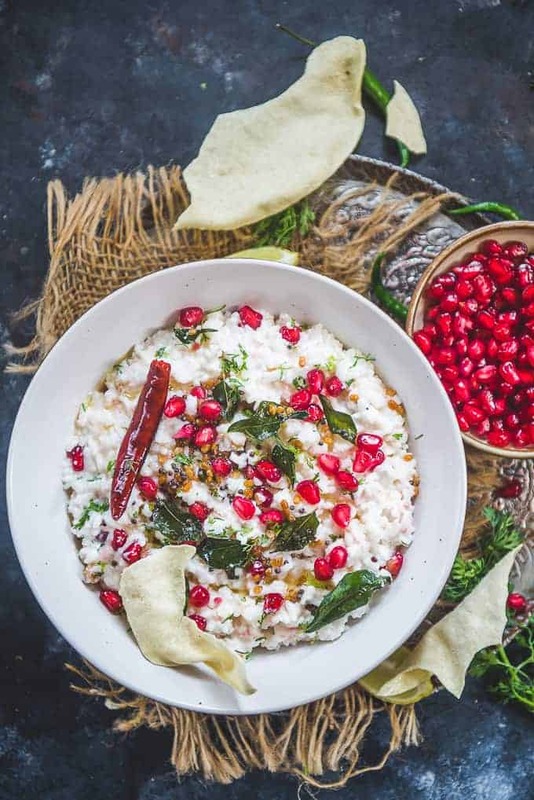 Curd rice, daddojanam, yogurt rice or thayir sadam is another rice dish from South India where cooked rice is mixed with curds and then seasoned with a tadka of urad dal mustard seeds, green chillies and curry leaves. My sister is visiting us with her family and her son eats non spicy food, just like mine. To keep the kids happy, I make sure one of the meals is either curd rice, khichdi or stuffed parathas. So when I planned to make it for yesterday’s lunch it stuck me that I haven’t posted it yet on the blog and with Sankranti coming soon, it will fit in my theme too. Win win right? So without thinking twice, I got on about making the dish. You can cook the rice for this in a pressure cooker and let it cool before mixing it with curd or use leftover rice. I like to cook my rice with little extra water so that they becomes a little mushy. And then while mixing curd, I use my palms and slightly mash the rice with the curd. This is one of the best Indian left over rice recipes which you can make in no time if you have curd at home. 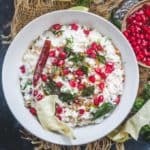 What to serve curd rice with? Also applam or fried rice papads go very well with curd rice and I make sure to fry a few whenever I make this dish. You can skip adding green chilies if making it for kids, like I did. It tastes great when served chilled but you can pack it for lunch box too. So guys, here is how to make curd rice. Do try it in your kitchen too. How to make Curd at home? Making curd at home is quite an easy process and with just some starter at hand, you can make a batch regularly. To make curd, heat milk until it is lukewarm. Add a tsp of starter and mix well. Cover the bowl and keep undisturbed for 6-8 hours or until the curd is set. Sometimes I also add a dried red chilli to my milk. I have heard it helps in setting the curd even without the starter. I like to overcook my rice a little bit with some extra water. It make the curd rice mushy and the curd nicely mix with the rice. You can add any vegetable of your choice or even skip adding any if you wish. Curd rice tastes best with a side of spicy mango pickle and fried apalam. You can make this rice in advance and refrigerate it. Before serving, just put the fresh tadka and it is ready to serve. I like my curd rice chilled with a fresh warm tempering. You can also make curd rice using leftover rice but I prefer freshly cooked rice as it’s easy to mash it up. Curd rice is one of the best thing to eat when you have an upset stomach and eating curd rice daily definitely improves the digestion. It is easy to digest and the probiotic helps in the growth bacteria which aids in digestion. It cools the body and helps in maintaining internal body temperature. Thayir sadam is quite filling and keeps you fill for a long time so you don’t snack on unnecessary things. It indirectly helps to maintain the body weight. It is rich in anti oxidants and helps body fight the infection. Does Curd Rice cause acidity? Curd has slight acidic nature and it might cause heartburn to some. If you are prone to acidity, then avoid eating curd rice. Does Curd Rice cause cold? Curd is considered as mucus forming food and it triggers mucus formation and can worsen the cold. So I would suggest avoiding it for a few days while you have cold and cough especially at night time. Does Curd rice make you fat? Eating curd and rice in moderation cannot make you fat. In fact both the ingredients have health benefits when taken in moderation. When to start yogurt rice for babies? It’s best to start giving curd rice to babies when they turn a year old but you should still consult your doctor before starting to give it your kid. Each kid is different and can react to thing which other kid might not. So consulting your doctor before starting anything new to them is should be a must. Can Thayir Sadam be heated? Curd rice tastes best when refrigerated for a few hours but you can eat it at room temperature as well. It is not advised to heat curd rice as the curd may separate due to heat and the taste with alter because of that. If you do not like chilled curd rice either do not refrigerate it and eat it just after making or if you has already refrigerated it, leave it on kitchen counter for a few hours before eating. Can Thayir Sadam be eaten at night? Avoid eating curd rice at night if you are prone to cold and cough. Wash the rice and cook with 1 and 1/2 cup of water until cooked and most of the water is absorbed. Rice should be mushy. Bring the rice to room temperature. Add curd, milk, carrot and salt in the rice and mix well. Slightly mash the rice using using your hands. Heat oil in a pan. Once the oil i shot, add mustard seeds and curry leaves and let them crackle for a few seconds. Add urad dal , ginger and dry red chillies and fry until dal turns slightly brown. Pour the tempering over curd rice and mix well. Garnish with fresh coriander and pomegranate seeds. Serve chilled. Curd Rice is a delicious south Indian recipe where cooked rice is mixed with curd and a tempering is done to it. It is a full meal in itself and can be had any time of the day. Wash the rice and cook with 1 and 1/2 cup of water until cooked. Rice should be mushy. Bring the rice to room temperature. Add curd, milk, carrot and salt and mix well. Slightly mash the rice using using your hands. Once the oil is hot, add mustard seeds and curry leaves and let them crackle for a few seconds. Add urad dal, ginger and dry red chillies and fry until dal turns slightly brown. Pour the tempering over curd rice and mix well.